RESULTS: The organism responsible for the discolouration of the water was identified as B. braunii. Microscopic examination revealed large colonies that floated in a thick layer on the surface of the water. 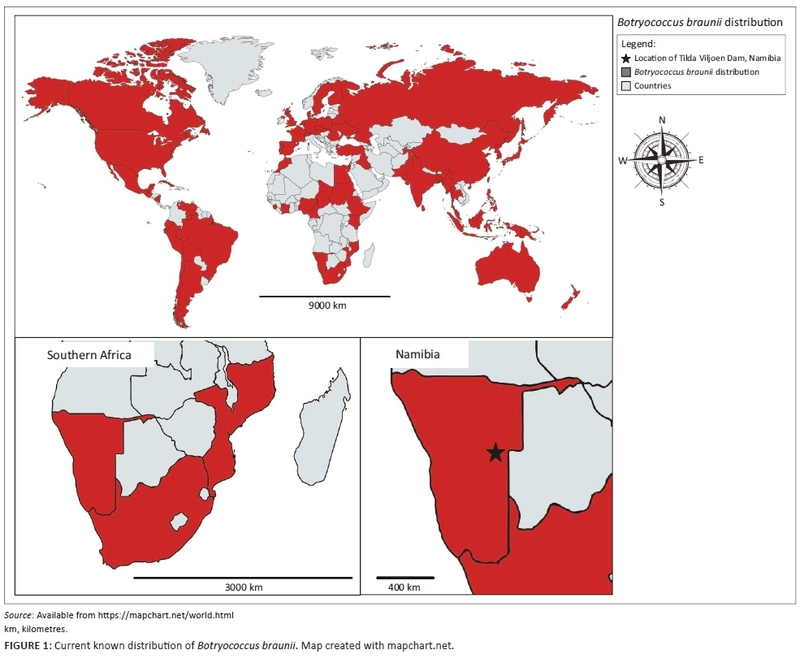 Literature searches on the geographical distribution of B. braunii revealed that this was the first record of this species' presence in Namibia. The Tilda Viljoen Dam (22°26'42.21''S 18°57'26.21''E), a small rock-fill dam with a concrete outlet, is situated near Gobabis in Namibia (Figure 1). It supplies drinking water to Gobabis. The dam was completed in 1964, the dam wall has a height of 14 m and a length of 630 m. The full supply capacity is 1.224 million m3 and it has a surface area of 1.9 km2. The colonies of B. braunii are free-floating, large (100 µm - 500 µm in diameter), sometimes forming several dense clusters of subcolonies with indefinite shapes. Subcolonies are often attached to each other by thread-like mucilaginous connections (Figure 2d). Guy-Ohlson and Lindström (1994) described this as 'branching' of the colonies. Temperley (1936) found that branching usually occurs when the colony is about 30 µm in diameter and composed of 30 individual cells. In other cases, the refringent threads, linking the clusters, are absent (Metzger & Largeau 2005). The entire colony is imbedded in a mucilaginous matrix composed of fatty acids that add buoyancy to the colony. Individual semi-transparent cells are oval to pyriform in shape (Figure 2e) and surrounded by a cellulose wall. Cell size (length × width) is in the range of (8-9 × 5) µm to (13 × 7-9) µm (Liu, Sun & Gerken 2014). Each cell is embedded in a cup-shaped base (Figure 2e). The cups are at least two thirds of the cell length with the tips of the cells emerging from the cups. The cups are initially very thin, but increase in thickness with consecutive cell divisions (Guy-Ohlson & Lindström 1994). Besides the fact that the presence of B. braunii blooms may cause alarm among people when high enough densities rapidly change the colour of the water from green to red or burnt orange, people are also sometimes alarmed as these blooms can look very much like a gasoline spill or oil slick, because of the high amounts of lipids secreted by the algae. The bloom in Namibia turned the water a rusty orange-red colour and a thick layer of algae was floating on the surface as a result of density differences caused by the lipids. 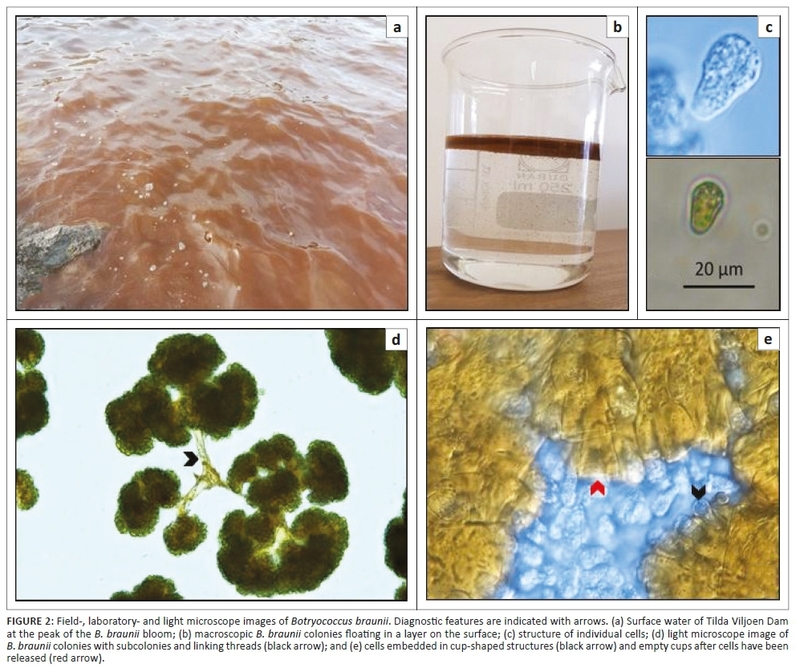 The orange discolouration of the water may be an indication that the species belongs to the orange pigment-producing chemical 'Race B' strain recognised by Senousy et al. (2004) from Lake Ayamé, Côte d'Ivoire, West Africa. Confirmation of this race would, however, require an 18S rRNA sequence data analysis. NAMIBIA. Omaheke region: Tilda Viljoen Dam near Gobabis, 22°26'42.21''S, 18°57'26.21''E, 15 November 2017, Almirall 1 (PUC) (Figure 2).